Mary Alice Gibson Cline, 88, of Ridgeway, VA, was peacefully taken home on Sunday, January 13, 2019. She was born October 25, 1930 in Franklin County to the late John Bunyan Gibson and Martha C. Miles Gibson. In addition to her parents, she was preceded in death by her husband, Jack Lewis Cline; two sisters, Kathleen McMillion and Bunny Bowman; and one brother, Ted Crawford. Mrs. Cline was a graduate of Henry High School and Perry Business School and retired after 42 years as a service representative for Lee Telephone Company and Centel in Martinsville. She loved her work and her co-workers. She and her husband, Jack, were married for 62 years and were faithful members of Horsepasture Christian Church. She loved reading, opera, classic movies and musicals, gardening, baking, sewing, collecting thimbles, and traveling with friends and family. She was gentle in spirit and humble in heart; a patient, devoted, and loving daughter, sister, wife, mother, mother-in-law, and grandmother. 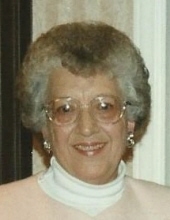 She is survived by three sons; Brad Cline and wife Mary of Ridgeway, VA, Danny Cline and wife Kathy of Dry Fork, VA, and Steve Cline of Ridgeway, VA; four grandchildren; Erin Cline Thompson and husband Joel, Stuart Cline, Matthew Cline and wife Michelle, and Lauren Cline; and one great-grandson, Jack Thompson. Also surviving are several nieces and nephews. A graveside service will be held at 11:00 AM on Wednesday, January 16, 2019 at Horsepasture Christian Church with Minister Lee Ashley officiating. Visitation will be held at Horsepasture Christian Church from 6:00-8:00 PM on Tuesday, January 15, 2019 and at other times at the home at 915 Horsepasture-Price Road. In lieu of flowers, donations may be made to Horsepasture Christian Church, 1146 Horsepasture-Price Road, Ridgeway, VA 24148 or to the Alzheimer's Association, 355 Rio Road West, Suite 102, Charlottesville, VA 22901. Norris Funeral Services, Inc. and Crematory of Martinsville, VA is serving the Cline family. To send flowers or a remembrance gift to the family of Mary Alice Gibson Cline, please visit our Tribute Store. "Email Address" would like to share the life celebration of Mary Alice Gibson Cline. Click on the "link" to go to share a favorite memory or leave a condolence message for the family.